Pimenta-piripiri – Sensual-hot-spicy, this is, unusually, how one could describe my small factory in Lübeck. From my travels in India. Mexico and Portugal I discovered my love for piripiri and other chillies. Piripiri - what a spice! Chillies contain capsaicin, which - depending on the amount - can even make us shed tears. And besides its healing properties, spicy chili is also an aphrodisiac. In history, the combination of spicy chili with chocolate, is a confection the ancient Aztecs were familiar with. They roasted and ground cocoa beans, mixed them with water, vanilla and spicy chili and called it “Xocoatl”. As a seasoning - not only in chocolate as a beverage - chili has an indefinite number of combinations. My passion challenged me to create and supply the very best products. From 'flor de sal' to extra virgin olive oil, my ingredients come from small, specialist suppliers in Portugal. For production, I use only fresh and dried aromatic herbs, spices, vegetables and high quality fruits. 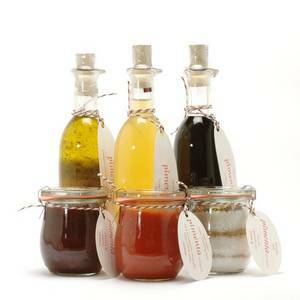 Pastes, chutneys and vinegars are always produced without the addition of dyes, preservatives or artificial flavourings. My products are a must for anyone who enjoys something special. In fact, we should all try everything at least once!